If you are looking to incorporate unique culinary ideas into your wedding day, you may want to consider serving cheese in a way most of your guests will have never seen before. 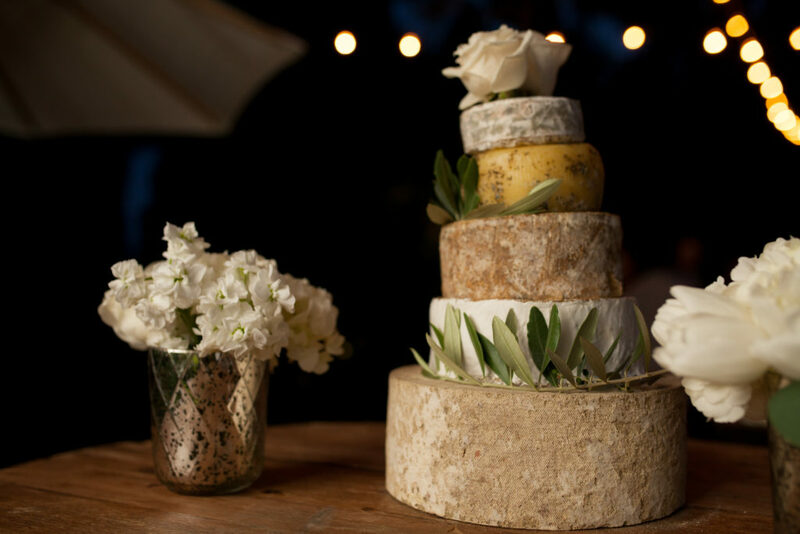 Serving stacked layers of cheese wheels instead of a traditional wedding cake is a big trend in Europe and a concept that has made its way across the pond. It is a fabulous gluten-free alternative for guests who avoid wheat and gluten. Also, it can serve as a delicious late-night indulgence. It is usually quite costly for a venue to keep the kitchen open for late-night dining. A wedding cheese cake serves as the perfect alternative. Mix up textures. Think layers of semi-soft blue, hard cheddar, buttery triple crème adorned with a delicious goat cheese on the top layer. Served with a selection of crackers, baguettes and gluten-free treats, as well as seasonal fresh and dried fruits, nuts and delectable chutneys and local honey. You may want to have Port and dessert wines available at the bar as well. For proportions, you will want to allow approximately three ounces of cheese per guest. For a wine country wedding it is an opportunity to showcase our delicious local, farmhouse cheeses. If time permits, visiting the cheese makers in Napa, Sonoma and Marin can be a wonderful addition to your weekend itinerary. Cowgirl Creamery in Point Reyes is one of our personal favorites. A small, organic creamery in downtown Point Reyes Station. It is about a one-hour scenic drive from Napa to Point Reyes Station. Most famous for their celebrated Mount Tam, Red Hawk and Devil’s Gulch cheeses. A perfect day trip from Napa! Point Reyes Farmstead Cheese Company is famous for their delicious blue cheese. Contact them at for their touring availability. Closer to home, you can visit Skyhill Farms in Napa Valley – an excellent farmstead for organic and local goat cheese.